It started with literally a golden ticket. 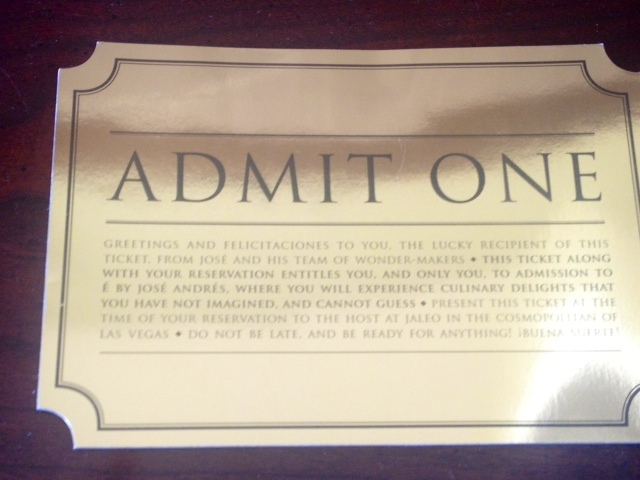 After successfully securing a highly coveted slot at the 8 seat e by Jose Andres in Las Vegas, I received this a week before my reservation. This was a perfect way to start what would become one of the most truly unique dining experiences of my life. On the back of the ticket was my seat assignment – 3 along with the note that my menu would be customized due to my garlic allergy. Sunday couldn’t come soon enough. 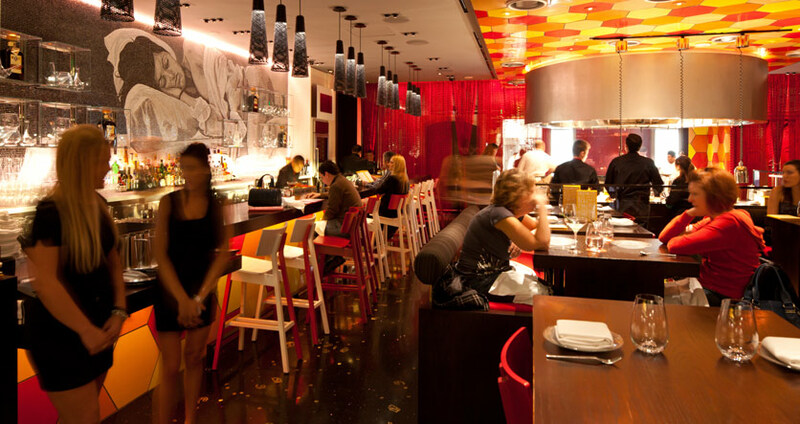 e is located inside Andres’ popular Spanish restaurant, Jaleo, which is part of the impressive restaurants within the Cosmopolitan hotel and casino. Although I had never been to Jaleo, I had eaten at his other spot, Chino Poblano there once before, which was the first time I experienced the amazing salt air margarita. 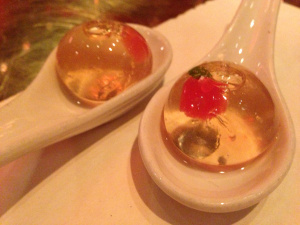 I’m an Andres devotee, having been to The Bazaar too many times to count and even the SaaM dining room, which was the closest thing I had experienced to true Spanish molecular gastronomy. So, suffice it to say, I was excited to try this even more intimate and experimental meal. Upon arrival, I was escorted over to a table in the main room, where most of my fellow e companions were seated having drinks. I struck up a conversation with the gentleman sitting across from me and found out he was a military consultant who helps law enforcement identify IEDs. We chatted for about 15 mins or so about our shared love of food and finally were instructed to follow our server to the e dining room. The room was behind a large glass door and our server explained that the various trinkets spread around are from Jose’s world travels and that we had now entered into Jose’s mind. 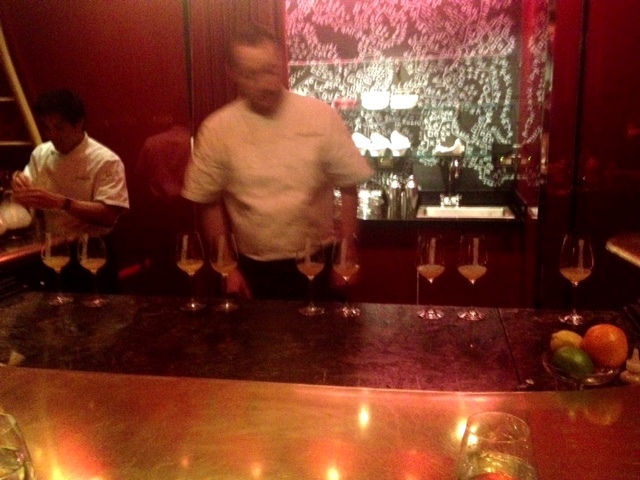 The chef and his sous were busy working on a drink, which they said would be our first course. The lights had already been lowered and we were told that photography was permitted as long as no flash. So, I apologize in advance for the less than optimal quality of the rest of the pictures. I did my best. a nice pungent earthy aroma to the smoky Mescal. 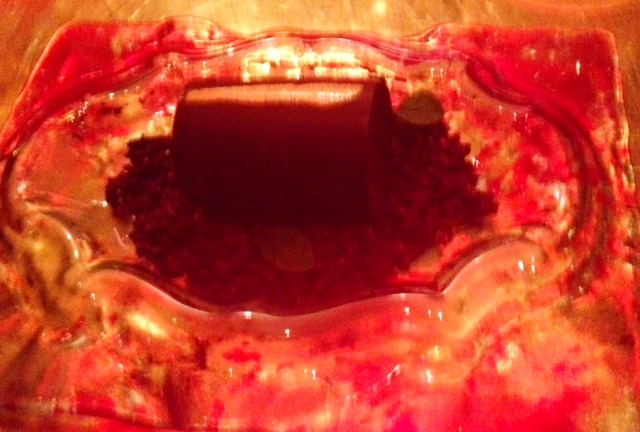 We were then presented with our first of several “bites” This one was called Apple “Brazo de Gitano” – a traditional Spanish tapa that had been deconstructed and reshaped. The texture was close to freeze dried ice cream that you can get at space museums but of course with a lot more complex taste in the inside. Once again, it was clear that this wasn’t going to be anything close to a traditional meal. A couple of minutes later, the Nitro Almond Cup arrived. The chef explained that the stones were ice cold to keep the temperature for the dish consistent and we should eat it in one bite, quickly. 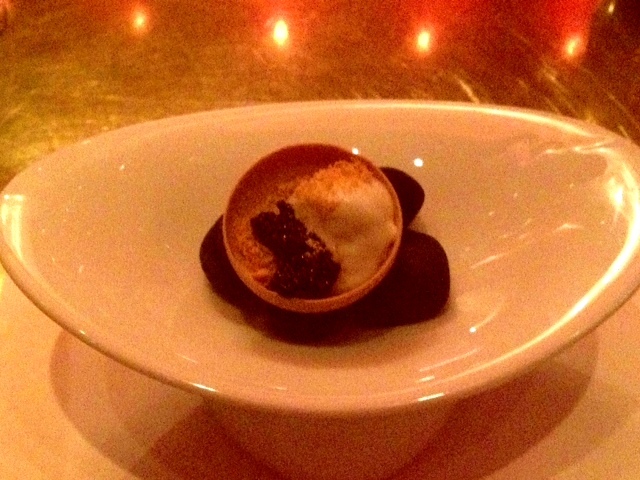 The shell was made of Marcona almond and inside was a generous spoonful of Spanish caviar – white and black. The shell burst in my mouth with a blast of cold, nicely paired with the salty caviar. Another winner. Next up was another timbal (drum) this time Jose’s take on a barquillo, which is a traditional Spanish cookie but in this case it was stuffed with anchovies and truffles. I wasn’t the biggest fan of this one but admired how much effort it took to make. This was quickly followed by the first course where we needed silverware to eat it. 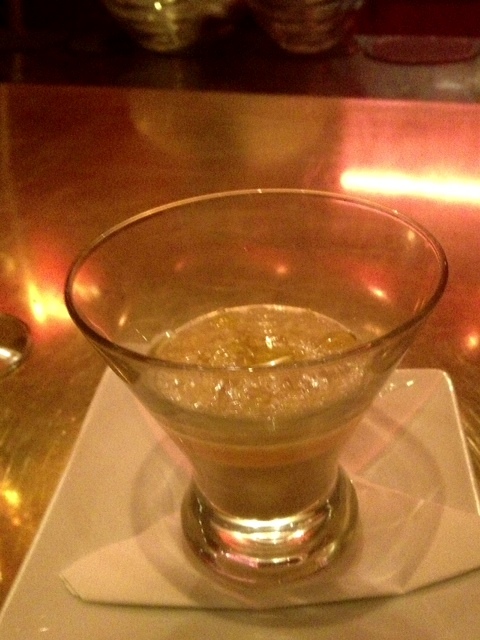 Named “El Vermut” it was a modern take on a classic Spanish dish of mussels cooked in vermouth. 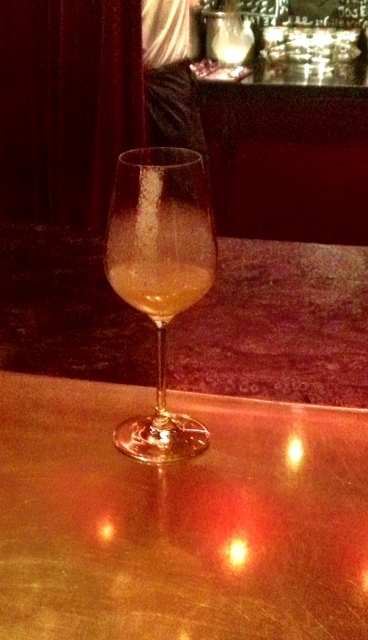 In this case, the vermouth had been turned into a foam, which dissolved when you took a bite with the mussels. I’m not a huge fan of mussels but this was quite good. Next was Merienda, which is “snack” in Spanish. I must admit I got a bit lost in their explanation about how they perfected the bun after hearing it was a ham and cheese mini sandwich, with the fabled jamon iberico de belota (considered one of the best hams in the world) along with idiazabal cheese. Suffice it to say, this rocked. 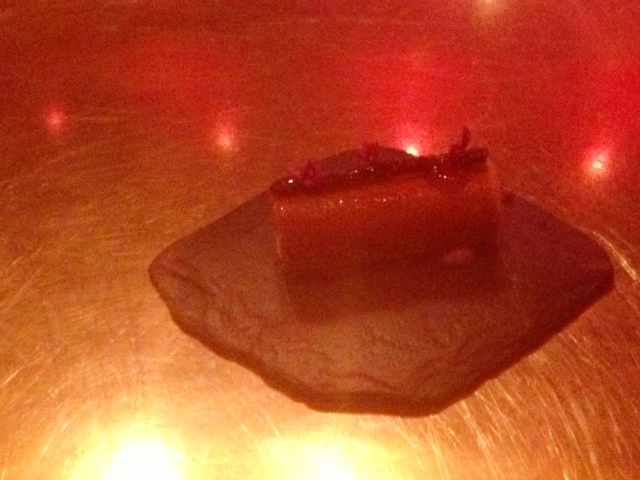 Our final bite was called Crispy Chicken Skin en Escabeche. 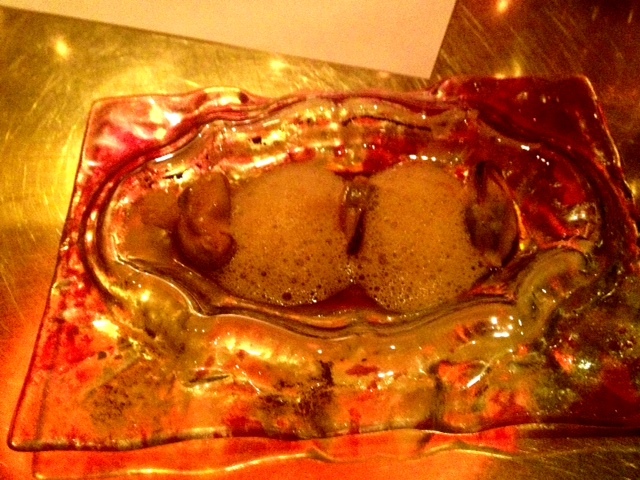 Two perfectly cooked chicken oysters on a piece of crispy skin and an acidic “escabeche” form. A great capper to these extraordinary first bites. into my mouth. Very refreshing. Next came the first of three alternate courses for me given my garlic issues. While the rest of the table got a ham and white bean ragout, I received this lovely beet salad with roasted beets and a beet sorbet with an intense yellow beet consome. Fortunately I love beets so this was a delight to eat. 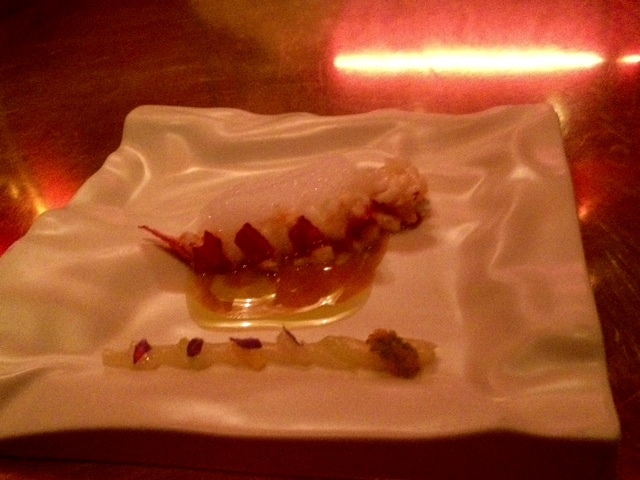 I rejoined the rest of the group for this course – Lobster with Citrus and Jasmine. 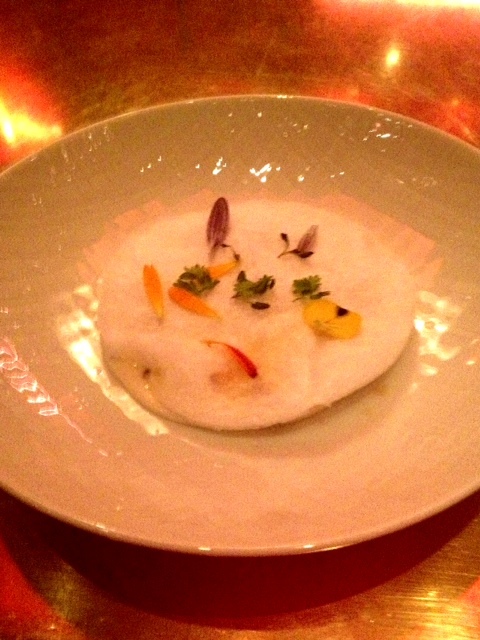 A generous helping of lightly poached and then grilled on the plancha chunks of lobster meat with a side of citrus gelee with a foam of jasmine. We were instructed to drag the pieces of lobster through the citrus gelee to get to those nice notes of acid against the rich meat. Damn good. 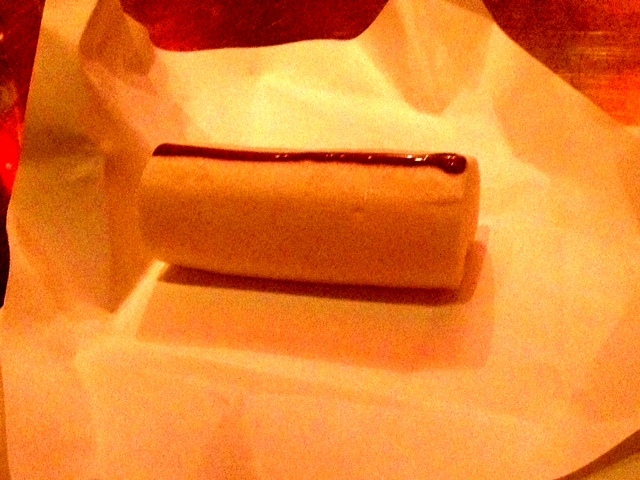 As soon as I heard the next course was a pil pil, I knew I was getting something different. Fortunately, once again I think I actually came out ahead as I got this amazing “zucchini in many textures” instead. It was a stunning combination of soft and crunchy preparations of zucchini that sang harmoniously together. I had never had anything quite like it. Confession time. I’m not really a fan of foie gras so the recent California ban didn’t phase me. 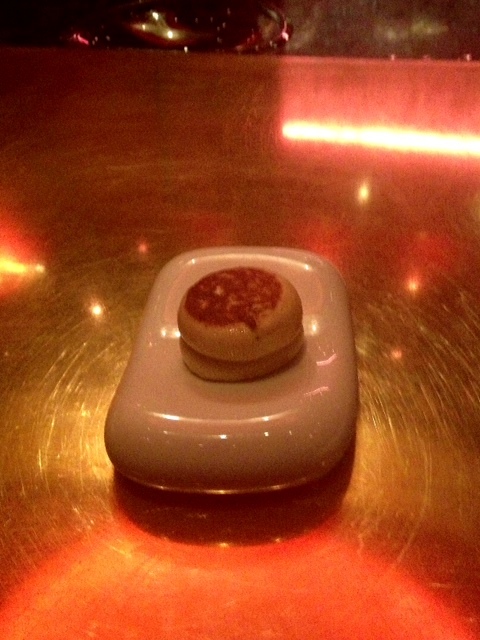 So, when the next course was presented as Foie Gras with Black Truffle, I knew it wouldn’t be my favorite. 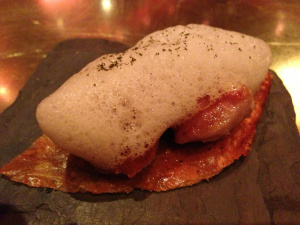 The foie gras in this case had been freeze dried into a powder along with heaping shavings of black truffle. 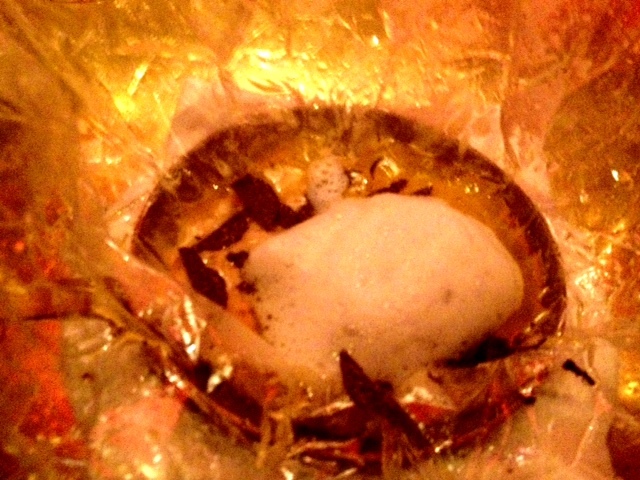 It was in the bowl because they then went around to pour liquid foie gras into it which rehydrated the foie gras. 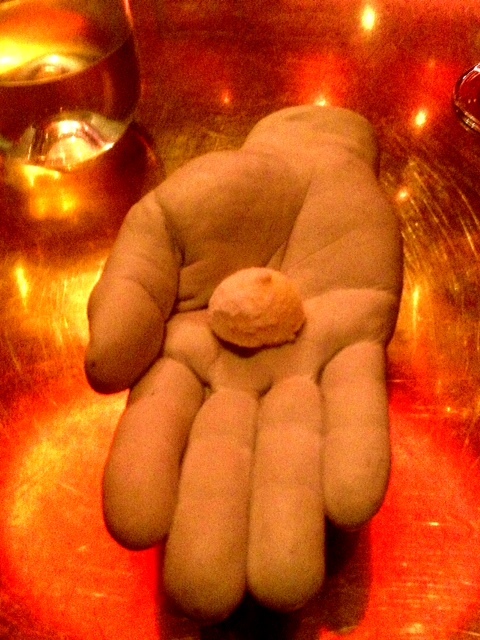 I was done after a few scoops but again could certainly appreciate the effort it took to make this. Next was the biggest departure from the rest of the group. They were presented this beautiful and massive lamb shank, which would be carved and served. I, on the other hand, had this placed in front of me. 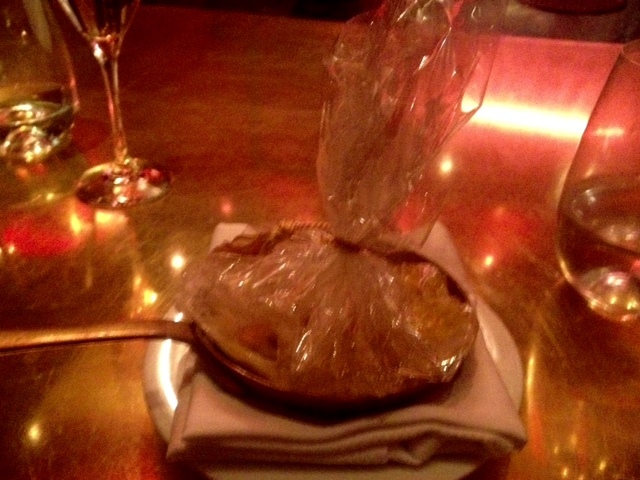 A server appeared next to me, explaining this was mushroom “risotto” en papilotte. She cut open the bag, which was a special type of plastic that they had made specifically for this dish, given that traditional parchment paper wouldn’t have been able to support it. Once opened, she then proceeded to add an idiazabal cheese foam and shaved black truffles over the top, which made my seatmates ooh in appreciation. The “risotto” was actually the tops of enoki mushroom made to look like arborio rice along with a super rich mushroom stock. The umami taste was off the charts. This was my favorite course. Wow. After a much needed break, the next course was our “cheese course”, which not surprisingly, looked nothing like a typical cheese course. Called Santa Gadea with cotton candy, it was an interesting combination of a strong Spanish goat cheese along with a slightly sweetened (but not typical) cotton candy. I’m not a big cheese course guy but this was fun. Finally, it was time for sweets. 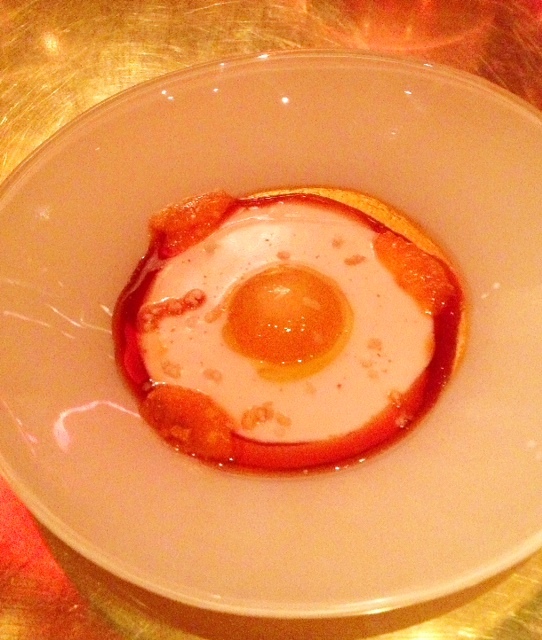 First up was this incredibly playful version of a Catelan classic – Crema Catalana Egg. Made to look like a sunny side up egg, with an actual yolk that had been sweetened in the center, it was basically a more liquid version of a flan along with some tart tangerines on the bottom. A great dish. The timbal shape returned. This time, it was the After Eight Timbal. 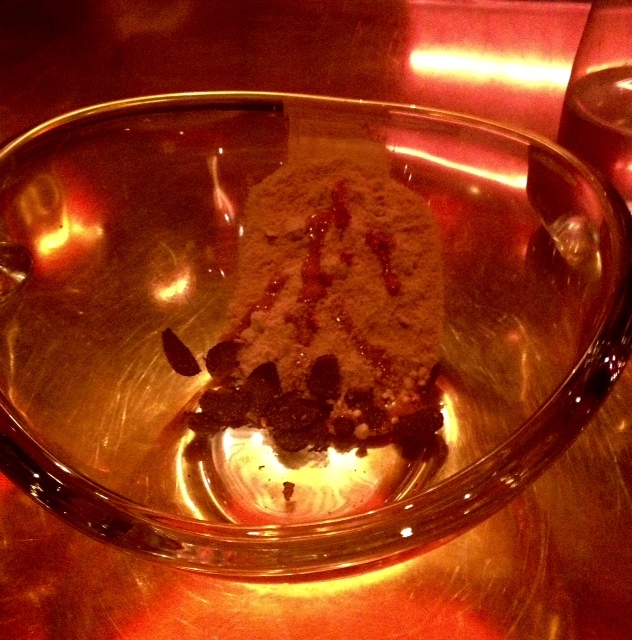 The chef explained that Jose loves After Eight dinner mints and this was his interpretation of it. We were told to take the 2 spoons they had given us and tap both sides of the timbal. This made the timbal collapse into a pool of dark chocolate. Inside as well were some micro mint leaves and a mint oil that apparently is made specifically for Jose. It tasted pretty much exactly like an after dinner mint, which I love so this was a home run for me. A box was placed in front of me that looked like a Cartier jewel box. 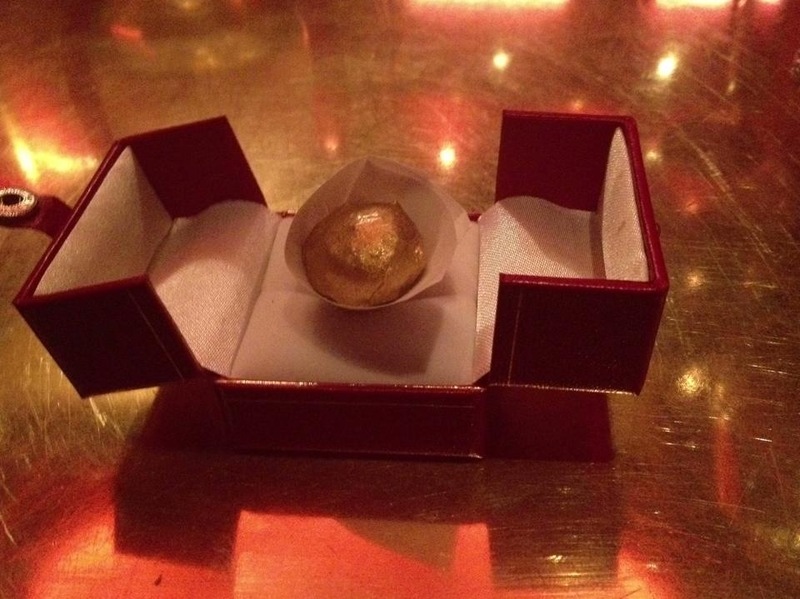 We were told to open it and inside was Jose’s take on the famous Ferrero Rocher bon bon, except in our case, that was real edible gold on the outside. It tasted pretty much exactly like the original. Yet another whimsical bite. By this point, I was almost out of gas but who could resist a sweet bite, called Yemita – served in a replica of Jose’s actual hand. 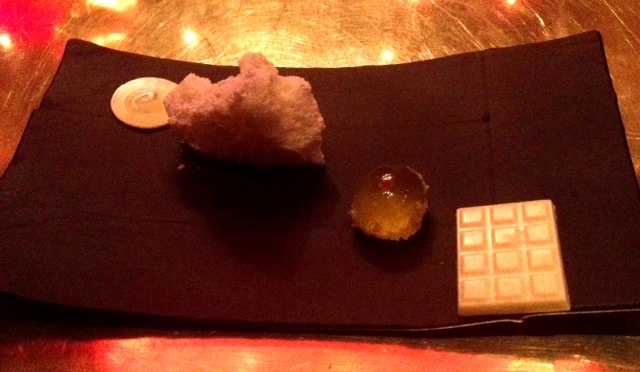 After 18 courses, the final one – More Things – arrived consisting of 4 bite-sized desserts. There was a coin of white mint chocolate, a fluffy piece of cotton candy, a mojito jellied candy and a tablet of spiced chocolate. 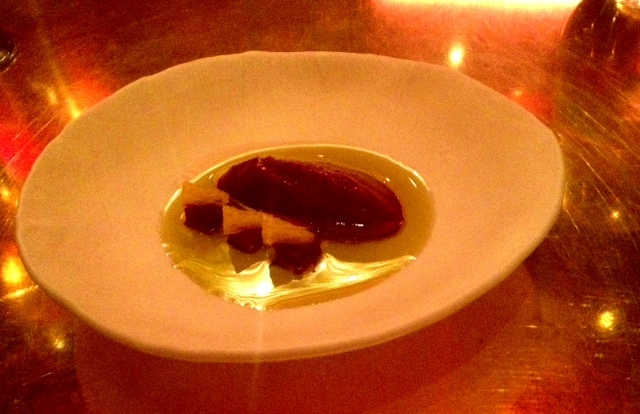 A nice way to cap off this truly epic meal along with a glass of 1985 Pedro Ximenez sherry. After almost 3 hours of culinary magic, we were thanked by the entire staff and told that since we are in a place of inspiration if we would share something that inspired us in a book they passed around. We were also given our individual e guest number. I was 9306. I pushed away from the table, said goodbyes to my fellow dinner patrons and left in a state of true bliss. It was by far the most I’ve ever spent for myself on dinner but worth every centavo. Posted on January 17, 2014 by reyalto. Bookmark the permalink.